Looking at this ad, we all know that there was a time, not too long ago, when people actually believed this to be the truth. That smoking was good for you! 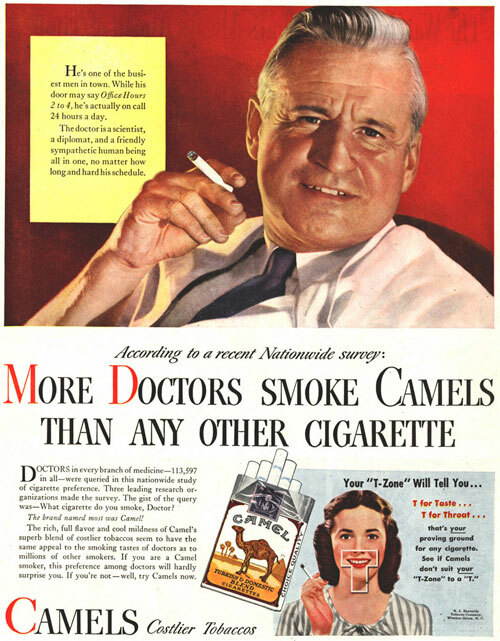 Look, the doctors are doing it, so it must be healthy and good for you…many people believed! If I was to look into a crystal ball today, I predict that the same will come true for meat-eating and dairy consumption! Soon enough, more people will come to realize that not only is a plant-based diet healthier, but it is also better for our planet and we will be able to feed the worlds hungry, save on precious water resources, plus we will no longer be causing unnecessary pain and suffering to billions of animals every year. I predict, we will also see a significant decrease in heart disease, cancer, obesity, diabetes and other common illnesses.